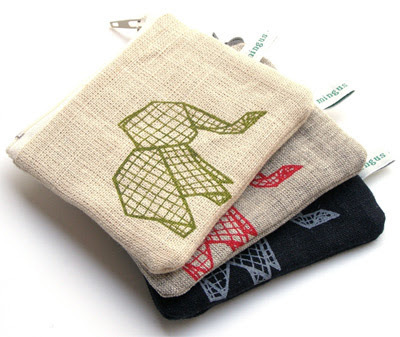 Check out these super-cute eco-friendly accessories from Mingus Designs, handmade with love in Melbourne. A range of cool Mingus Designs illustrations are printed by hand onto sustainable fabrics and then hand-sewn into purses, bags and t-shirts. Illustrated cards are made from recycled paper. And divine animal and bird brooches are hand-crafted using upcycled leather or vegan-friendly materials. 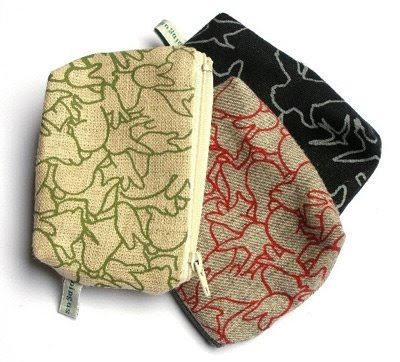 I adore the origami illustrations on both the purses and greeting cards, and just love the material used for the cloth purses - hemp and yak hair blend! You can find Mingus Designs accessories on Etsy and DaWanda and at various stockists listed on the Mingus Designs website. I am in love with those purses! Thanks all for your comments. Such sweet purses. Make sure you check out the bags and brooches from Mingus Designs too. Soooo cool. Mingus make so much great stuff, including excellent bags too. *Swoon* And those purses are soo sweet! Glad you think so Spin Spin - your pieces are pretty swoon-worthy too!